From left: John Bartlett, executive chairman of APH; Dan West, president of Action Sales & Marketing; Dave Berge, regional sales manager at BBB; Joe Bergsieker, regional vice president of sales at BBB; Glenn Barco, senior vice president of sales at BBB; Jay Knopick, account manager at Action Sales & Marketing; Corey Bartlett, president and CEO of APH; and Rich Vierkant, vice president of merchandising at APH. 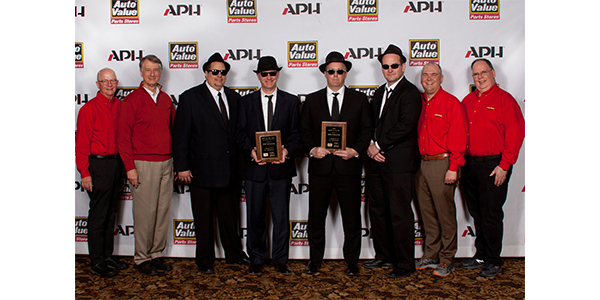 Automotive Parts Headquarters Inc. (APH), a Minnesota-based aftermarket auto parts distributor and store group, recognized outstanding supplier achievements from 2018 with all of its storeowners, managers and salespeople present. The recognition took place at APH’s annual Winter Conference, held recently at Cragun’s Resort and Conference Center in Brainerd, Minnesota. The employees of APH helped determine recipients of the supplier awards, which were presented by John Bartlett, executive chairman, and Corey Bartlett, president and CEO. Rising Star – Castair Inc. Outstanding Training Support – Standard Motor Products Inc.